If one thing has become abundantly clear in the past week, it is that what we say matters. The choices we make in our verbiage are not just reflections of our “political correctness;” they have the power to alter our very perception of reality. As a physical therapist, nowhere is this more evident to me than in the language that surrounds pain and injury. How often do we hear language like “she suffers from osteoarthritis” or “he is a stroke victim”? These terms are thrown around by not just the people (not patients!) themselves, but by their doctors, pharmaceutical advertisers, sympathetic friends and relatives, and even well-meaning physical therapists. These terms quickly become a part of a person’s identity. You are no longer just a person who had a stroke, you’re now a victim, or a sufferer, as if you had no choice in the matter. Your well-being appears to be out of your control. Psychologists call that an external locus of control, and physical therapists know that research shows that your locus of control can predict how well you recover from a painful experience. But luckily, we are not passive participants in our pain experiences! We make choices in how we respond to the events in our lives. Why not start those choices with how we discuss them? Part of this is a concept called person-first language (in that the person is mentioned before the impairment or disability), and it is taught to medical professionals and people in the disability community. It is a change in how we speak that means putting a person first, then adding something about their condition, when applicable – which means that the person’s identity always comes before their physical condition. Doesn’t that sound like how it should be? Who wants to be defined first and foremost by their physical characteristics? The other part is putting words to the experience of pain, injury, and disability. Just because someone has a disability does not mean that they suffer from it. When I sustained a spinal fracture in a car crash two years ago, I made a conscious decision that it might hurt, but I would not suffer from it. You can have a labral tear, or a degenerative disc, and not suffer from it. Pain isn’t a choice, but suffering is! 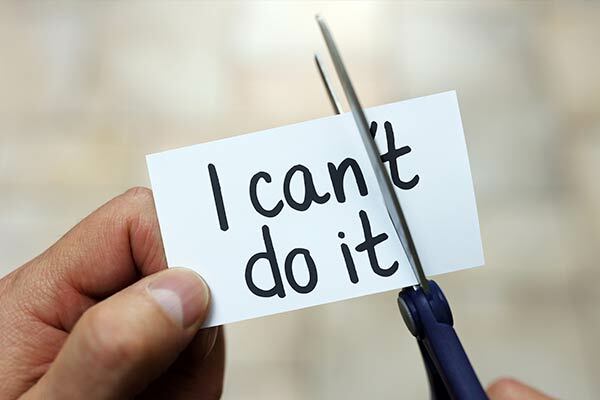 We all have power over how we perceive our pain experience – thanks in part to our self-efficacy, our belief in our ability to control our motivation and behavior. If you don’t how to get started down this road, talk to your physical therapist or mental health provider about self-efficacy and pain management. As we were reminded as a nation this week, we don’t always get to choose what happens to us, but we do get to choose how we respond, and part of that is in our language. Words can bring fear, or they can bring hope. Here’s my challenge to you: when you talk about your health (or someone else’s), choose hope!